I just finished reading Dan Torre’s book Cactus (Reaktion Books, 2017), which is a kind of social history of cacti. Unfortunately, his discussion of cactus evolution was limited to just a couple comments in an appendix in the back. Because my interest was aroused, I thought I would investigate further. The cactus family is a New World genus consisting of about 1750 species of plants. They are subdivided into four subfamilies; the cactoids (the typical stem cacti, and about 75 percent of the species), the opuntioids (the prickly pears), the Pereskia (17 species, and these divided into two groups), and the Maihuenia (two species). 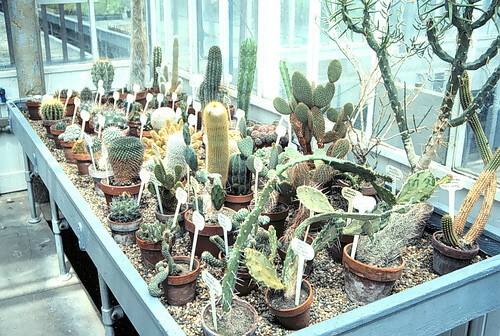 A group to study cacti classification was established in 2012 to overlay DNA testing onto the traditional morphological classification system used by cacti taxonomists. Early results show that more than half of the species tested show no common ancestors with the other species in the same subfamily, so there will be major shifts in reclassification in the future. What makes cactuses cacti is a set of shared morphological and physiological traits. Most people associate a desert environment and thorns with cacti, but not all species have thorns and many cacti are found where orchids grow. As with any big, complex family there are lots of variations on the theme, and that is what makes them so interesting. Cactus fossils are unknown, so pinpointing the time and place of origin involves some guesswork. Because no cacti are found in Africa, they must have evolved after the breakup of Gondwana which happened about 120 million years ago. Recent genetic analysis and population radiation studies suggest that the family is of relatively recent appearance, first appearing between 30-35 million years ago, probably in southern South America. It is speculated that the ancestor of the cactus family were scrubby trees from a seasonably dry, but relatively warm climate. The uplift of the continent as the Andes began forming probably increased the rate of speciation within the cacti. The Amazon River used to dump into the Pacific Ocean, but about 15 million years ago the Andean uplift reversed that flow with an enormous freshwater lake forming across much of Amazonia. The current river channel opened up about 10 million years ago and the inland lake was no more. The region got colder and drier and the rate of dispersal increased as the Andes rose. Meanwhile, further north, Central America was in the process of bridging the North and South American continents. The movement of tectonic pieces of the puzzle that represents Mexico, the Caribbean and the narrow parts of Central America took place over the course of 100 million years, but the final joining of the continents only occurred about five million years ago when the land mass that is now Panama formed. So, cactus migration into North America has been relatively rapid. In that 5 million years species of prickly pair have migrated through all of the United States and into parts of Canada. The cactoid group, primarily because they don’t display the freeze tolerance of the opuntioids, have lagged behind in the desert southwest, but give them a few more million years and they will probably continue to radiate out in to the dry, often barren parts of the western states. Many gardeners profess a deep and abiding hatred of the cacti – especially the thorny kind – but they are tough and interesting plants. By knowing a bit more about them, even the most stony-hearted cactus hater might learn to appreciate them a bit more.